Discussion in 'Guitar Emporium Archive' started by Lkdog, May 2, 2016. 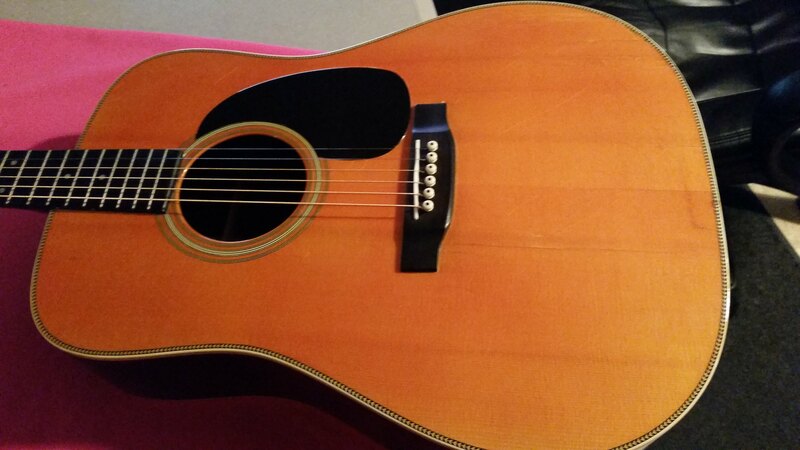 Am thinking of selling this 1988 Martin HD 28 as I am about a 95% electric player and this gets little play time. I got it used from a recording musician a couple years ago. It is technically an HD 28 P which I think the P meant a more single note playable profile neck back in the 80's. It had been professionally aged and had some surface lines from natural age already on it that had been sealed. A couple other minor dings, but nothing of note. Was in VG condition. A few months ago it had to have some surface work done on lower bout due to some minor damage after being dropped by my 13 year old daughter. 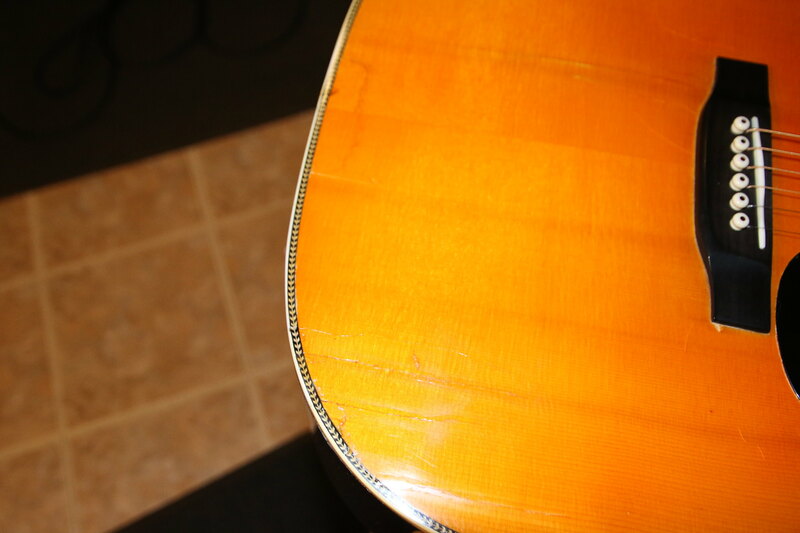 It was repaired by a local professional who handles all of the serious luthier repair work for the big box stores locally. Totally functional, but you can see where the repair took place and the surface crack area repaired is not totally smooth and flat. In the picture album the pictures are labeled "After Repair" and there are close ups. It is solid repair, but cosmetically not pristine and not totally smooth or flat. Has compensated bone saddle & bone nut. Action is low (2/32 high E to 3/32 low E) and plays pretty easy and I am not an acoustic guy. I have 12’s on it now. Intonation seems OK, but likely could use a pro setup. Relief is pretty flat and no buzzing. Comes with an installed PUTW #27 Acoustic Guitar Soundboard Pickup and I also have a LR Baggs Para Acoustic DI and these are included. Has Martin case that is beat up with one bad back hinge and the ribbon popped out that holds it open when you open the case. 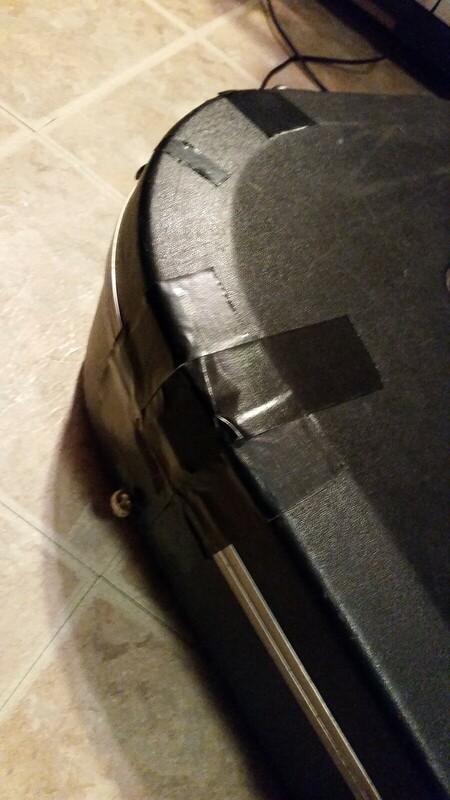 Did some duct tape repairs, and it works and can be used for taking to gigs if you don't throw it around too much and handle with some care when case is open. Ok- this all sounds like it is a real beater- it really isn’t, but I want to be very clear as to condition. Sounds great- a real cannon and through an amplifier with the versatile LR BAGGS DI sounds great. One of easiest acoustics I have played and I kind of stink on an acoustic. Again- note the After pics to see the repair area. I am pricing accordingly to reflect the repair work on the right lower bout. Asking $1225 shipped and insured via PP Gift. The pickup and the Baggs preamp are worth a couple hundred used alone, so I think this asking price for the whole kit seems to make sense. But- let me know your thoughts. Open to reasonable offers. It is a player. Had some questions on the case. 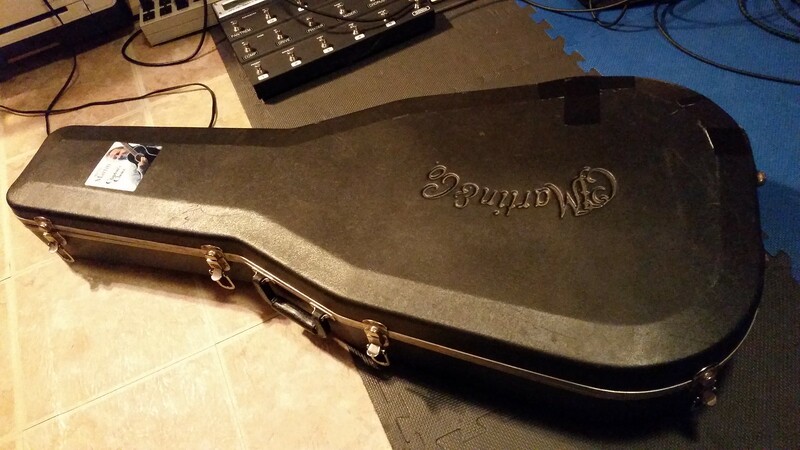 It is an original Martin Hard shell case. It works, just has one bad back hinge which is duct taped secure, and the ribbon that holds it open is also taped in now. All of the latches work and latch and handle is fine. You can pretty much use it like any hard shell case. It is just not pretty. Dang! 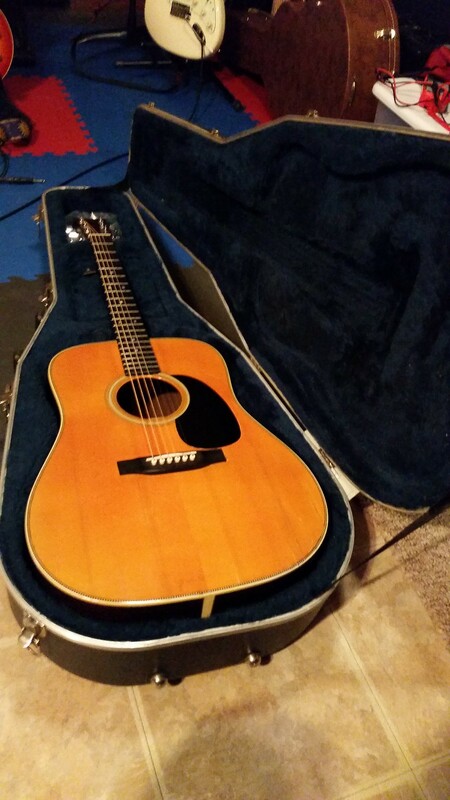 This is really good deal on a GREAT sounding acoustic! I picked one up about a month ago. GLWTS! Have some trade offers but still available. Had requests for more pics of the repair area. Here is High Def image of the repair area which is about 2"x3". This image has been resized. Click this bar to view the full image. The original image is sized 2048x1365. Price reduced to $1225 PP Gift shipped and insured.